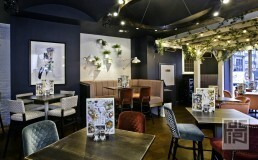 Working closely with Stonegate to evolve the look and feel of their Slug & Lettuce brand, the use of colour and texture was key with bold statements and key furniture pieces that would create the right voice for the current customer and attract new ones. The introduction of a ‘Master Class Station’ has created a tactile experience which the brand has tried to follow with other areas like ‘selfie mirrors’. The key to the brands success was the open spaces and intimate areas, with the introduction of ‘Bird cages’ that create a private oasis that are enhanced with botanical planting and feature wallpapers. The client wanted the brand to appeal to a more female friendly audience and attract new customers. 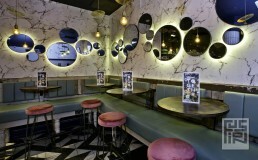 The results of our design delivery is an opulent cocktail bar, using antique and authentic metallic velvet finishes, set against a back drop of exposed brick and tiled wall and floor finishes to create a luxurious plush environment. We are delivering these new schemes to many of the existing sites across the UK. 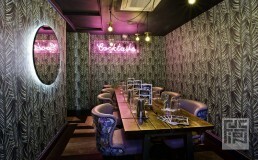 The cocktail masterclass unit is a key cornerstone for the new look Slug and Lettuce brand and features across all sites. This serves as a fixed place for functions, cocktail making lessons and also provides a vital feature location within the interior scheme. The neon sign and fixed feature table allows groups to get together and enjoy the best spot in the house. We have developed a monochrome colour scheme within both the ladies and gent’s toilets, adding gilt mirrors and dramatic wallpapered ceilings, all of which have been well received by guests and the client, meaning the loos are definitely a place to check out!